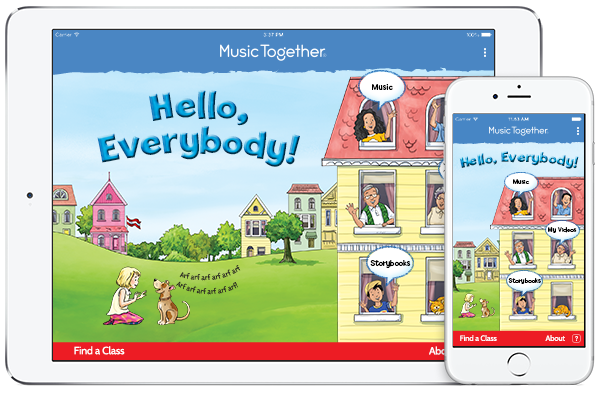 To create an account or add a new collection of songs, you will need the access code from one of the CDs you received with your class materials. Find the 15-digit code on the inside front cover of your Song Collection CD booklet. To create an account, select "Log in" from the app menu and follow the on-screen instructions. Once finished, you can immediately use your account. To add a new collection to your account, select "Access Code" from the app menu, enter your code and tap "Submit." Your new music will immediately appear in the app as long as you are logged in. The Family Music Zone is just for families enrolled in Music Together. There, you'll be able to download the semester's songs and explore resources, activities, and more to help you make the most of your Music Together experience. Your Family Music Zone homepage will display the songs and semester-related family content for whichever unique music access code you most recently entered. Content for previous semesters will get automatically archived in the Music area each time you enter the unique code contained in your new semester's materials. You will need the 15-digit access code from the inside front cover of your Song Collection CD booklet. Then go to https://www.musictogether.com/account. If you have any trouble, please contact Music Together support at support@musictogether.com for assistance. Now you can play your Music Together songs at home and on the go!